Well people, we've made it. This is the last installment of the 2012 MLB season preview. Thank you to all those who read the NL Central preview from last week, I got a lot of great feedback. With the regular season just a few days of fully being underway, let's wrap this up with the National League West. About the only question mark when spring training opened for the Arizona Diamondbacks was the availability of shortstop Stephen Drew, and it became clear early on that he would not be ready for opening day while recovering from the effects of a season-ending ankle injury July 20. Willie Bloomquist and John McDonald will share the position. The D-backs were encouraged by the progress of young pitching prospects Trevor Bauer, Tyler Skaggs and Patrick Corbin and know where to turn if injuries strike the already set rotation. Stephen Drew is helped off the field in 2011 after his season ending leg injury. The D-backs like Kennedy and Hudson so much that they talked about opening negotiations on long-term contracts with both after talks with catcher Miguel Montero fell apart early in spring. Both are coming off career years, and Hudson has added a slider that could be used as a put-away pitch to go along with his fastball/changeup mix. Cahill struggled in his early spring work, but that is his history and the D-backs are not concerned. Collmenter was pushed back from one early spring start because of forearm tightness, but because of his work last season was guaranteed a rotation spot by manager Kirk Gibson, providing he is healthy. Bauer is probably the top option. 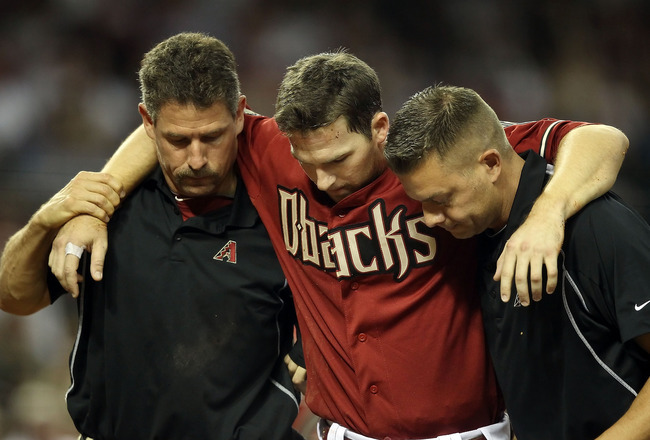 Final Thoughts: Much like their 2011 season, the Diamondbacks will rely heavily on their youth. Blanco tutored Miguel Montero on the finer points of footwork and defensive play last season while providing a strong clubhouse presence, and Overbay has been a mentor to Goldschmidt. The key to the Diamondbacks repeating will fall into the pitcher's hands, especially the bullpen. The Colorado Rockies have had a healthy spring. They are hopeful of a fast start with thirteen of twenty-two games at home in April, and six of their nine road games against the Astros and Pirates. Jeremy Jhoulys Guthrie gives the rotation a much-needed veteran, who can be counted on to log 200 innings and has had a solid spring. Chacin has a world of potential but is still seeking the fastball command consistency to realize it. He came to camp with mild biceps soreness that hasn't kept him from doing his work but has caused his velocity to dip. The Rockies don't believe that will be a lingering issue as Chacin gains arm strength. Juan Nicasio has miraculously returned from a broken neck he suffered Aug. 5 and pitching as though nothing happened. He needed to prove he could physically and mentally come back from a horrific injury to win a spot in the rotation and has done so. Drew Pomeranz looks ready to build on his September call-up, when he made his major league debut at the end of his first professional season and pitched well in three of four starts. The Rockies will monitor his innings out of long-term concern, which will put a premium on having depth in the rotation. Jamie Moyer, 49, pitched well enough to win the final spot in the rotation and complete a stunning comeback after missing the 2011 season following Tommy John surgery. 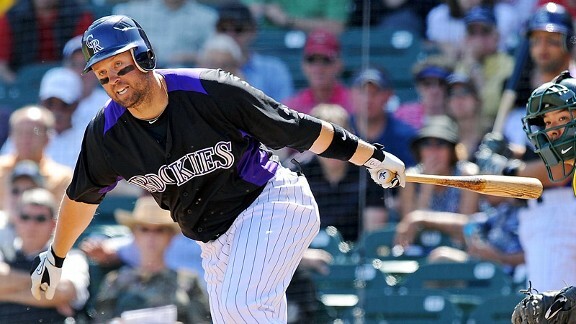 Newest Rockie Michael Cuddyer looks like boost team's already deadly offense. The lineup is deeper than last year and should score more runs, which will be of great benefit to a rotation that has questions concerning depth, experience and, ultimately, effectiveness. Dexter Fowler, who has gotten stronger through offseason conditioning, and Marco Scutaro have not hit well this spring, and Scutaro could end up seeing time hitting leadoff. Not because he's fast but because of his ability to get on base. The hope is that Scutaro, being a veteran, will find the groove that comes with experience. In Fowler's case, the hope is he can get his timing down with the leg kick he so successfully incorporated in the second half last year. He may be the key guy to making this lineup truly function well. Unfortunately, Fowler hasn't been on base enough to fully utilize his speed and try to steal, something the Rockies want him to do more of this season. Carlos Gonzalez and Troy Tulowitzki are marquee talents. Todd Helton is more of a doubles than home run hitter at this point but gets on base often and makes pitchers work and can wear them down and affect their psyche with so many foul balls. Michael Cuddyer and Ramon Hernandez are proven veterans who will help lengthen the lineup. Casey Blake failed in a spring bid for the third base job, leaving Chris Nelson and Jordan Pacheco to man the position. Final Thoughts: The biggest test is going to be the Rockie's starting pitching throughout the year. Offensively, they are set. As I said before, they are much deeper then last year, and their bench is more reliable. This Rockies team can make a push, but I think Arizona's pitching will be tough to outlast. The San Fransisco Giants' rotation, among the best in the majors, won't have Vogelsong when the season opens. He probably will start the season on the disabled list after getting a slow start to spring training because of a back ailment. No problem, really. The Giants don't need a fifth starter until the ninth game on April 15. Tim Lincecum has a new two-year, $40.5 million contract, and Matt Cain just signed a five-year, $115 million contract. 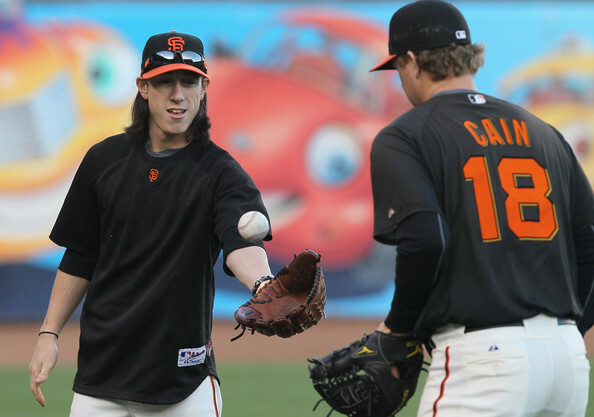 Aces Matt Cain and Tim Lincecum have new deals with the Giants for 2012. Brian Wilson seems to be okay after being shut down late last season because of a bum elbow and rehabbing most of the offseason. Sergio Romo had an elbow problem but vows to be ready for the opener. Affeldt and Lopez were re-signed to maintain a dangerous left-handed presence, and their training camps have been near perfect and mistake-free. Angel Pagan and Melky Cabrera arrived in trades to boost an anemic offense, and Cabrera clearly had a better spring training than Pagan, who's replacing Andres Torres, who had a solid 2010 but struggled in 2011 and was shipped to the Mets in the Pagan deal. A healthy Buster Posey, whose season-ending leg injuries in May drastically hurt the Giants' playoff chances, will be a difference-maker. Without Freddy Sanchez, who will open on the disabled list because his shoulder isn't 100 percent, Emmanuel Burriss is a likely replacement at second, though veteran Ryan Theriot could get playing time. Brandon Crawford's chances of sticking at short will increase if he's able to hit in the .250 range. Final Thoughts: The Giants' three biggest health questions involved Buster Posey, Freddy Sanchez and Brian Wilson, and only Sanchez appears headed for the disabled list because his surgically replaced shoulder isn't sound. With Posey behind the plate and Wilson at closer, the Giants would be far more dangerous than the team that ended last season. Throw in additions Melky Cabrera and Angel Pagan, and the Giants are entering the season anticipating a run to the postseason similar to 2010. LHP Ted Lilly of the Los Angeles Dodgers will open the season on the disabled list with a stiff neck but is expected to be ready to pitch by April 14th, after pitching in a simulated game and one rehab start. Clayton Kershaw will start both Opening Day on April 5th and the Dodgers' home opener on April 10th, making him the first Dodgers reigning Cy Young Award winner to start on Opening Day since Sandy Koufax in 1964. Chad Billingsley has made mechanical changes to his delivery in hopes of improving upon his second-half decline in 2011. Javy Guerra and Kenly Jansen lead the back of the pen, with Guerra starting the year as the closer after converting 21 of 23 save opportunities in his rookie season. Jansen, who set a MLB record with 16.1 strikeouts per nine innings last season, lurks in the wings as the closer in waiting. Josh Lindblom is in a battle with LHP Scott Rice for a temporary spot in the bullpen for the first eight games of the regular season while Ted Lilly is on the disabled list. Thanks to a scheduled off day on April 9th, the Dodgers don't need a fifth starter until April 14th, creating a spot for the eighth relief pitcher. Andre Ethier figures to bat cleanup on most days, especially against right-handed pitchers, with Rivera hitting cleanup and Ethier batting fifth against left-handers. Dee Gordon is projected to have a huge year on the base path, but many are concerned he will struggle finding his way on base. Dee Gordon is a future star in the making for the Dodgers. "If you have your three and four guys going, it's tough for the pitcher to choose his battles," Ethier said. "Our main goal is for me and Matt to play off each other and help each other get better, and beyond that help the guys in front of him and behind me." Final Thoughts: In addition to the Dodgers being sold to a group headed by Magic Johnson for $2 billion, the Dodgers have had a relatively healthy spring, with only a few minor injuries. RHP Blake Hawksworth will open the season on the disabled list after arthroscopic elbow surgery in January, but other than that the rest of the team will be injury-free as they break camp. It is only a matter of time before the Dodgers will be in the hunt again in the NL West. The San Diego Padres believe Edinson Volquez, one of four players received from the Reds in exchange for Mat Latos, is positioned for a comeback, and Petco Park will aid into that comeback as it is a pitcher friendly ballpark. Tim Stauffer is the veteran of the staff and was a model of consistency last season. But the 27-year-old Cory Luebke has the makings of being the staff ace. Both Clayton Richard and Dustin Moseley are coming off season-ending shoulder surgery, although Moseley's was to his non-pitching left shoulder to keep it from dislocating while hitting. Padres pitching coach Darren Balsley says Richard has never thrown smooth and his velocity has already reached 93-mph. 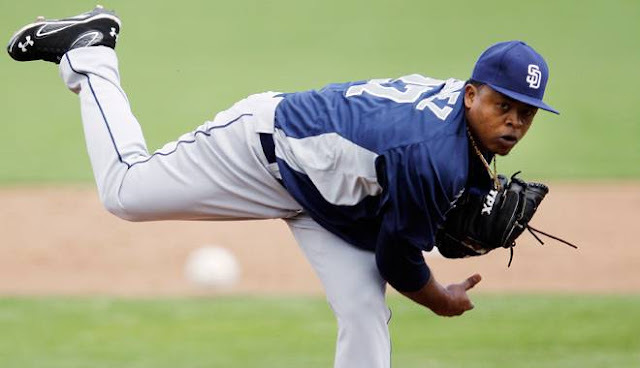 Edinson Volquez looks to rebound and have a great season in a pitcher friendly stadium. The Padres have lost a horse of a closer in Heath Bell through free agency. Huston Street doesn't have the durability to work three and four straight games, which means you could be seeing Andrew Cashner and Luke Gregerson in the closing role at times. Cashner hits three figures with his fastball and has a 90-mph change. Gregerson's slider was flat at times last year. Look for Anthony Bass to be working in the Padres bullpen rather than starting at Class AAA Tucson. Not having Carlos Quentin to start the season is going to affect the Padres offense. He is the lone Padre with the potential to hit 20 homers. But the Padres believe their lineup will be better all around. Look for an improved season from Will Venable, who has had a great spring and finally seems to have found a counselor he can listen to in new hitting coach Phil Plantier. The Padres believe Cameron Maybin, who signed an extension through the 2017 season, will grow into being a 20-homer, 40-steal threat (he is already there in steals). Chase Headley is solid except for woefully low power numbers. Yonder Alonso is a line-drive hitter whose style is better suited to Petco Park than Anthony Rizzo's. Padres are looking for both Orlando Hudson and Jason Bartlett to rebound slightly in 2012. Hudson, a major disappointment last season, has been battling groin problems this spring. Final Thoughts: The Padres will open the season without the slugger they acquired to hit in the No. 4 slot of what last season was the third-lowest run producing lineup in the major leagues. LF Carlos Quentin will miss at least the first two weeks of the regular season due to arthroscopic knee surgery on March 19th to repair a torn meniscus and remove floating particles. General manager Josh Byrnes believes the Padres could be improved in at least six spots in the lineup, including Quentin. But injuries are a concern. And that does it! Opening Day is an hour or so away (Marlins vs. Cardinals on ESPN), and the Brewers' Opening Day is less then 48 hours away! Baseball is back! Thank you for reading all six of these blogs, I thoroughly enjoyed doing this. As always, please leave your thoughts on here or on the Twitter feed (@WISportsBlog) if you agree, disagree, or want to make a point. I look forward to reading your comments. Also, one last thing. The Wisconsin Sports Blog (WISportsBlog) is now on Instagram! Follow that account for great pictures from Miller Park and around the realm of Wisconsin sports all year round! Thank you!